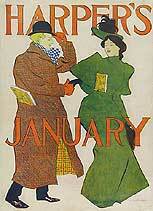 [Poster for Harper’s New Monthly Magazine, Jan 1895]. Man shaking woman’s hand. Three-color lithograph: yellow, red and blue. New York: Harper & Brothers, published Dec 1894. Signed bottom right: EDWARD PENFIELD. 13" w. x 18" h.
Ref: Bolton, pg 11; Quincy, 161; MCMA, 238; Whitehead, pg 36; Echo, 334; PAFA, 365; Richmond, 180; Reims, 1257; DFP, 340; Wong, 59; Lauder, 161; PAI-15, 459; Swann-1924, 298; PAI-34, 97. 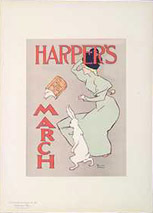 [Poster for Harper’s New Monthly Magazine, Feb 1895]. 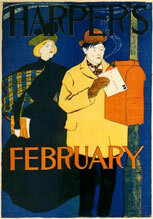 Woman watching man at mailbox with his Valentines to be mailed. Three-color lithograph: blue, yellow and dark red. New York: Harper & Brothers, published Jan 1895. Unsigned. 13" w. x 18 3/8" h.
Ref: Bolton, pg 11; Quincy, 161; MCMA, 238; Hiatt, pg 288; Whitehead, pg 36; Echo, 334; PAFA, 365; Richmond, 180; Reims, 1258; Flood, 303; DFP, 341; Lauder, 162; PAI-2, 86a; PAI-9, 439; PAI-28, 483; PAI-34, 98; PAI-35-442. 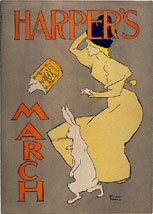 [Poster for Harper’s New Monthly Magazine, Mar 1895]. Woman in wind with March hare. Five-color lithograph: grey, light green, yellow, red and blue. New York: Harper & Brothers, published Feb 1895. Signed bottom right: EDWARD | PENFIELD. 13 7/8" w. x 19 3/8" h.
Ref: Bolton, pg 11; Quincy, 163; Hiatt, fp 288; MCMA, 240; Whitehead, pg 36; Echo, 336; Richmond, 182; Bella 2, 175; Reims, 1259; Flood, 304; La Forgue, pg 154; Hillier, pg 161; DFP, 342; Wong, 58; Margolin, pg 30; Gibson, pg 26; Lauder, 163; PAI-34, 99. [o.p.f. 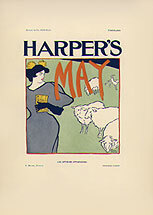 Harper’s New Monthly Magazine, Mar 1895, A 23]. Wash on paper, 1895. 5" w. x 7 1/8" h.
Ref: Gibson, pg 27; collection of Hays Penfield. [o.p.f. Harper’s, Mar 1895, A 23]. Color lithographic reproduction. Signed in image bottom right: EDWARD | PENFIELD. Image: ?" w. x ?" h. Sheet: 11 1/4" w. x 15 1/2" h.
"The Masters of the Poster" series was originally issued in monthly installments by Imprimerie Chaix, the lithographic studio of Jules Cheret, from 1895-1900. Small reproductions of popular posters were offered in a more manageble  and affordable  standardized format for collectors. Subscribers received four prints a month, for a subscription price of $3.00 a year. 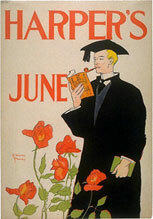 Two of Edward Penfield's Harper's posters were reproduced in Maitres, A 23 and A 37. Les maitres de l’affiche, issue 5, plate 20 (Paris: Imprimerie Chaix, Mar 1896). 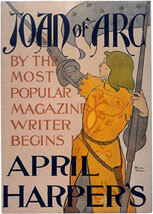 [Poster for Harper’s New Monthly Magazine, Apr 1895]. Joan of Arc in armor with sword and flag. Three-color lithograph: black, yellow and red. New York: Harper & Brothers, published Mar 1895. Signed lower right: EDWARD | PENFIELD. 12 7/8" w. x 17 7/8" h.
Late in 1894, Samuel Clemensnever a shrewd investor or businessmanwas in serious financial trouble. Together with surmounting debts from his own publishing concern and those of failed investments, Clemens was forced into bankruptcy. He needed to pay off his debts, so he decided round out’ several of his unfinished projects. His first effort was the painstakingly researched biography Personal Recollections of Joan of Arc.’ He completed the manuscript in France in Jan 1895, and sent it directly to Harper & Brothers. Five years earlier the story of Joan of Arc had generated a lot of interest when Sarah Bernhardt dramatized the French martyr’s life in Jeanne d’Arc,’ by Jules Barbier at her Théatre Porte Sainte-Martin. Her production was publicized in a grand poster by Eugene Grasset, which Penfield would use as his model. Penfield copied Grasset’s costuming right down to Bernhardt’s tunic of fleurs-de-lis. Grasset’s saintly Jeanne is stoicoblivious to a hail of flying arrowsan ideal surely apropós to the Divine Sarah.’ Penfield’s Joan is more openly defiant and warlikein an American expansionist stylewith her sword drawn. Samuel Clemens, Personal recollections of Joan of Arc; by the Sieur Louis de Conte (her page and secretary),’ part one of thirteen, Harper’s New Monthly Magazine, vol 90, no 539 (Apr 1895). 680-700. Illustrated by Howard Pyle. Ref: Bolton, pg 12; Quincy, 164; Hiatt, pg 288; MCMA, 241; Whitehead, pg 36; Echo, 337; PAFA, 366; Richmond, 183; Reims, 1260; DFP, 343; Wong, 60; Lauder, 164; PAI-34, 100. Left, Sarah Bernhardt as Joan of Arc, from Le Monde, 1891; right, poster by Eugene Grasset for Jeanne d’Arc,’ 1891. 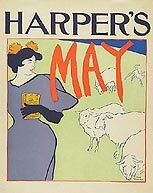 [Poster for Harper’s New Monthly Magazine, May 1895]. Woman in a blue dress with Harper’s, wandering through a flock of sheep. Five-color lithograph: light green, blue, yellow, purple and red. New York: Harper & Brothers, published Apr 1895. Signed bottom right: EDWARD | PENFIELD. 13 3/8" w. x 16 7/8" h.
Ref: MCMA, 242; Whitehead, pg 36; Reims, 1261; DFP, 344; Keay, pg 79; Lauder, 165; Swann-1941, 356; PAI-34, 101. [o.p.f. Harper’s New Monthly Magazine, May 1895, A 25]. Pencil, ink and wash on paper, 1895. 18 1/2" w. x 19 3/4" h.
Ref: Gibson, pg 26; original in print collection, New York Public Library, Astor, Lenox and Tilden Foundations. A 26.2 Print from Les affiches étrangères illustrées. [o.p.f. Harper’s New Monthly Magazine, May 1895, A 25]. Five-color lithographic and letterpress reproduction: light green, blue, yellow, purple and red. Signed bottom right: EDWARD | PENFIELD. Image: 5" w. x 6 1/8" h. Page: 8 1/2" w. x 12 1/2" h.
Penfield’s prints taken from Affiches, Das Plakat and Maitres are still highly collectable, and are thus included herein. Ref: Maurice Bauwens, Tadamasa Hayashi, Jules La Forgue, Julius Meier-Graefe and Joseph Pennell, Les affiches étrangères illustrées, G. Boudét, editor, (Paris: G. Boudét, 1897). [Poster for Harper’s New Monthly Magazine, Jun 1895]. Engrossed graduate with pipe, ignoring rose garden. Four-color lithograph: green, yellow, red and blue. New York: Harper & Brothers, published May 1895. Signed lower left: EDWARD | PENFIELD. 12 7/8" w. x 18 1/4" h.
Ref: Quincy, 166; MCMA, 243; Whitehead, pg 36; Richmond, 185; Reims, 1262; Flood, 305; DFP, 345; Lauder, 166; PAI-34, 102. [Poster for Harper’s New Monthly Magazine, Jul 1895]. German soldier at guardhouse. Four-color lithograph: grey, blue, yellow and red. New York: Harper & Brothers, published Jun 1895. Unsigned. 14 3/16" w. x 21 5/8" h.
Poultney Bigelow grew up a diplomat’s son in Europe, studied at Yale, and there was a classmate of Frederic Remington’s. As a writer and avid traveller, he preternaturally turned toward journalismwriting on many travel- and politically-oriented issuesand founded Outing magazine in 1882. Bigelow collaborated on many pieces with Remington, and liked to think of himself as Remington’s discoverer, as he was first to publish the artist in 1886. 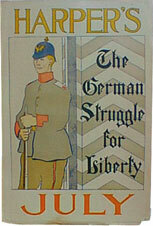 Penfield created this poster to publicize Bigelow’s lengthy history of the Germanic people, serialized in the Monthly as the first popular interpretation ever given to the rehabilitation of Germany through the uprising of the German people against the Napoleanic invasion. July’s number began the series, which was published by Harper and Brothers as a two-volume set in 1896. Poultney Bigelow, The German struggle for liberty,’ part one in a series, Harper’s New Monthly Magazine, vol 90, no 542 (Jul 1895). 202-219. Poultney Bigelow, History of the Germanic struggle for liberty, 2 vols (New York: Harper & Brothers, 1896). Illustrated by R. Caton Woodville and Otto H. Bacher. Ref: MCMA, 244; Whitehead, pg 36; Richmond, 186; Reims, 1263; Flood, 260; DFP, 346; Lauder, 167; PAI-34, 103. 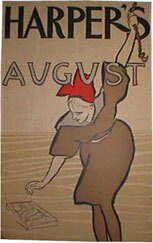 [Poster for Harper’s New Monthly Magazine, Aug 1895]. Woman at beach in bathing suit, reaching for Harper’s. Five-color lithograph: light green, brown, purple, red and black. New York: Harper & Brothers, published Jul 1895. Unsigned. 12 1/8" w. x 18 3/4" h.
Ref: MCMA, 245; Whitehead, pg 38; Echo, 338; Richmond, 187; Reims, 1264; DFP, 347; Keay, pg 80; Wong, 61; Margolin, pg 66; Lauder, 168; PAI-34, 104. 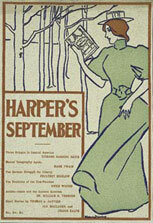 [Poster for Harper’s New Monthly Magazine, Sep 1895]. Woman with trees, type in box at lower left. Three-color lithograph and letterpress: red, blue and green on light green paper. New York: Harper & Brothers, published Aug 1895. Signed bottom center: EDWARD PENFIELD. 9" w. x 13 1/8" h.
This autumn scene shows a young reader walking through a leafless thicket of woods quite reminscent of Will Bradley’s In Russet and Gold book-cover design and Blue Lady’ Chap-Book poster. Ref: MCMA, 246; Whitehead, pg 38; Richmond, 188; Reims, 1265; DFP, 348; Lauder, 169; PAI-16, 412a; PAI-34, 105. 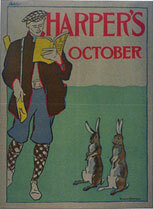 [Poster for Harper’s New Monthly Magazine, Oct 1895]. Hunter with Harper’s, ignoring two rabbits. Five-color lithograph: green, brown, blue, yellow and red. New York: Harper & Brothers, published Sep 1895. Signed bottom right: EDWARD PENFIELD. 11 1/4" w. x 15 1/8" h.
October’s hunting season, but evidently not for the habitual reader of Harper’sthis hunter is so engrossed with his copy, he doesn’t notice the nearby rabbits. Penfield explored a similar idea with St Nick in his Dec 1903 Collier’s poster. Ref: MCMA, 247; Whitehead, pg 38; Echo, pg 14; PAFA, 363; Richmond, 189; Reims, 1266; DFP, 349; Margolin, pg 30; Lauder, 170; PAI-16, 412b; PCI-5, 3; PAI-34, 106. 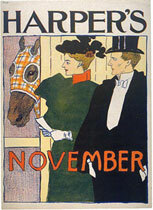 [Poster for Harper’s New Monthly Magazine, Nov 1895]. Couple appraising stabled horse at the New York horse show. Three-color lithograph: yellow, blue and red. New York: Harper & Brothers, published Oct 1895. Unsigned. 11 7/8" w. x 16 1/2" h.
Ref: MCMA, 248; Whitehead, pg 38; PAFA, 367; Richmond, 190; Reims, 1267; DFP, 350; Lauder, 171; PAI-31, 588; PCI-5, 4; PAI-34, 107. 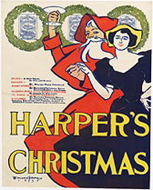 [Poster for Harper’s New Monthly Magazine, Dec 1895]. St Nicholas dancing with woman, three wreaths in background. Three-color lithograph and letterpress: yellow, red and blue. New York: Harper & Brothers, published Nov 1895. Signed bottom left: EDWARD PENFIELD | 1895. 20 1/4" w. x 25 1/2" h.
This posterthe largest in the Harper’s seriesagain depicts the jubilant St Nick that Penfield drew for the Christmas 1894 cover of Harper’s Weekly. The artwork was reproduced in red and black for the cover of the premier issue of The Poster. Ref: Whitehead, pg 38; Echo, 339; PAFA, 381; Richmond, 191; Reims, 1268; DFP, 351; Lauder, 172; PAI-34, 108.